A wise, balanced, and original approach to fostering a strong ‘us’ in marriage without losing the ‘you’ and ‘me.’ Hargrave is onto something that nobody in our field has captured before. This fresh perspective on what makes marriages work will jumpstart the efforts of every couples therapist. 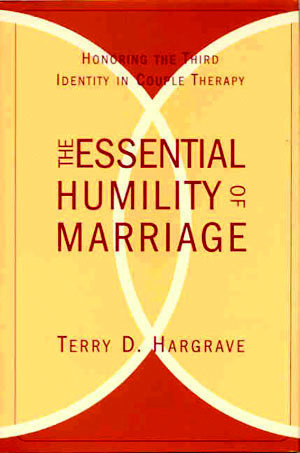 At its core is Hargrave’s message that much of what is currently done in couples therapy misses the point, focusing all attention on the need to accumulate more and more skills and to work toward ever-greater self-actualization. While there is a time and place for both of these concerns, Hargrave suggests that the real answer resides in some new math. Where once we believed that two became one, and then, more recently, that two remained two, Hargrave proposes that in strong marriages, two become three. The Essential Humility of Marriage explores the landscape of “you,” “me,” and “we.” The book clearly carves out this third identity, and then describes how its expectations and desires can take precedence over those of the individual partners–without taking away from either one. Why the concept of “us” plays such a central role in satisfying marriages is explained, and ways in which therapists can help couples first to acknowledge and then to strengthen that “us” are demonstrated. Hargrave doesn’t offer a single method or technique so much as an entirely new perspective on what healthy, growing marriages have in common, and where foundering marriages have gone wrong. He has written this book to help therapists help their clients to regain–or perhaps to discover for the first time–the rich mutual benefits that can come with a long-term relationship.